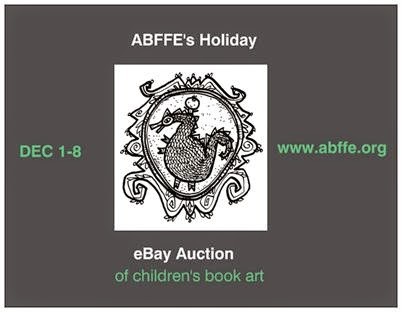 We have received some beautiful artwork and are now ready to start promoting our holiday children's book art auction. Would you please help us spread the word? We have some promotional cards: one is a business card (front/back) and the other is a postcard (front/back). The postcard size works well as a counter display with the business cards beside it for customers to take. Non-booksellers might enjoy the business card size since it fits well into wallets. Please email me at inessa@abffe.org and let me know how many of each you would like as well as your shipping address. If you are an artist and would still like to donate, there is still time! Click here for the donation form.